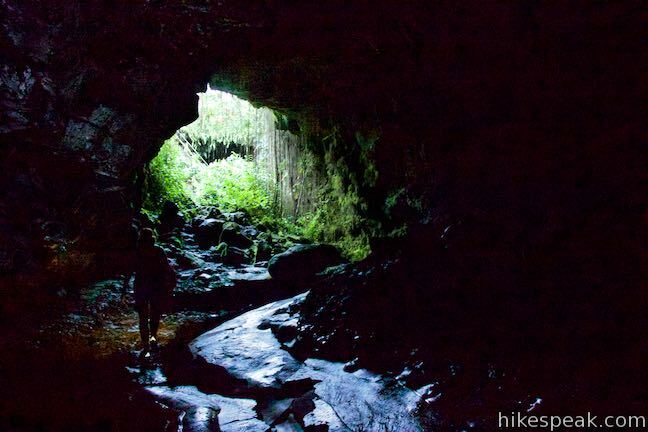 The Big Island of Hawai‘i is a dynamic land, where you can find a lava tube on the edge of the island’s main city. An 1881 lava flow from Mauna Loa stopped just short of Hilo. 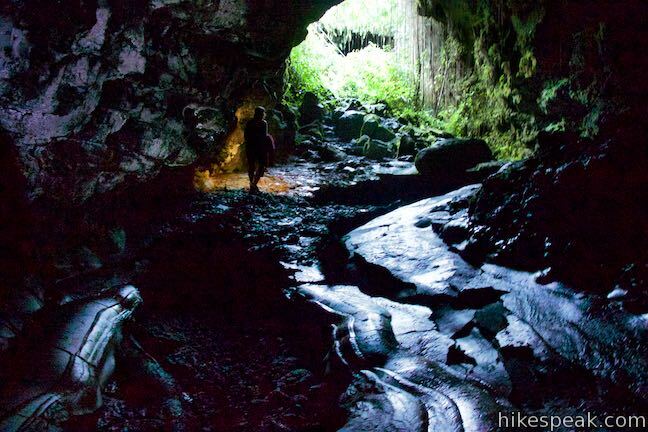 Venture up and down a lava tube created by that flow. 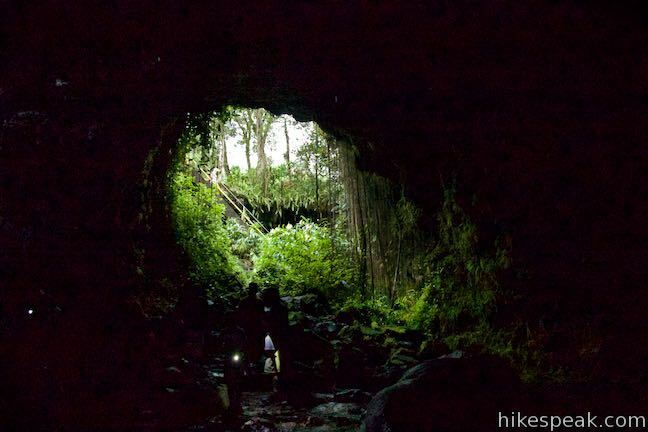 Enter through a collapsed skylight at Kaumana Caves Park and start exploring. 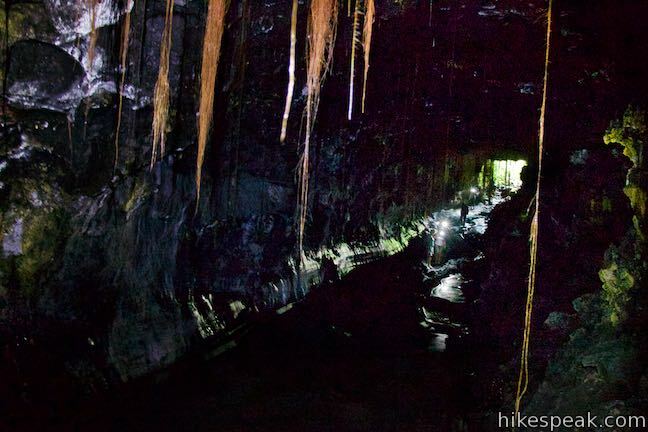 While the entire tube may measure over twenty miles long, visitors can expect to see somewhere under two miles from the Kaumana Caves entrance. Warning – enter at your own risk. 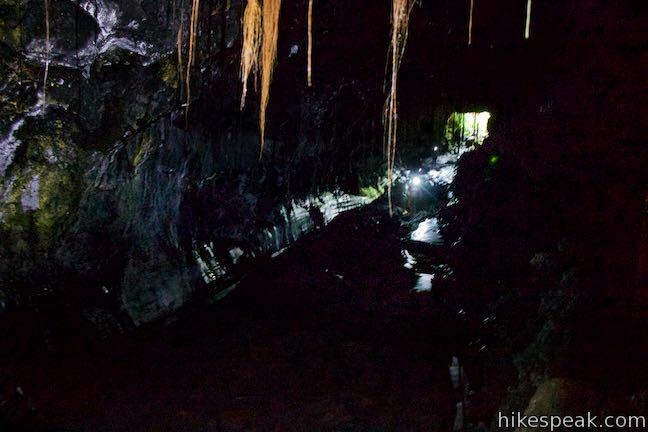 Cave exploration is inherently dangerous. The danger is increased in a seismically active and flood prone area. 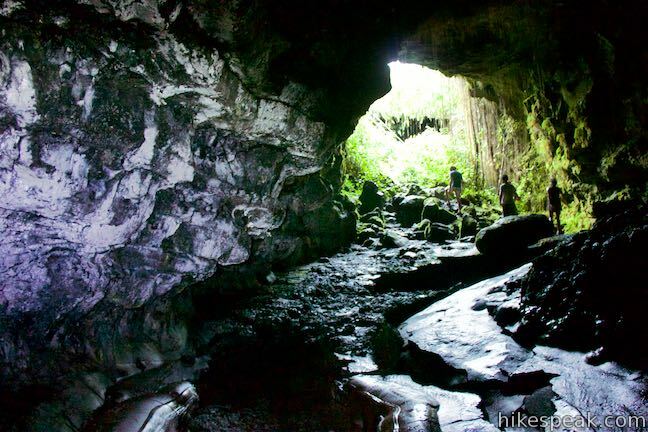 There are unseen dangers in this cave, which may cause risk of death or serious injury. 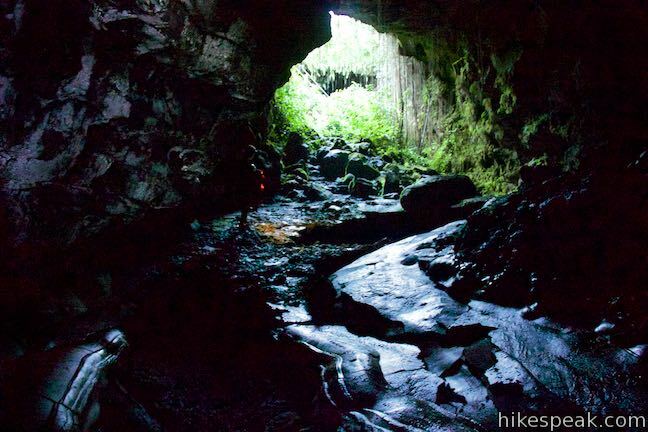 A confusing aspect of the Kaumana Caves lava tube is that some areas are preserved as a park, while other parts of the lava tube are privately owned (below private property). 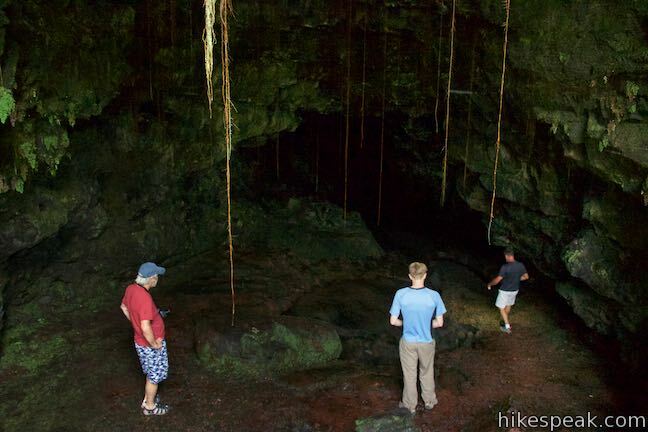 Visitors are granted entry into the public area of the caves, but it is not fully apparent what sections of the lava tube are off limits. There are no boundary markings showing the boundary for the park. 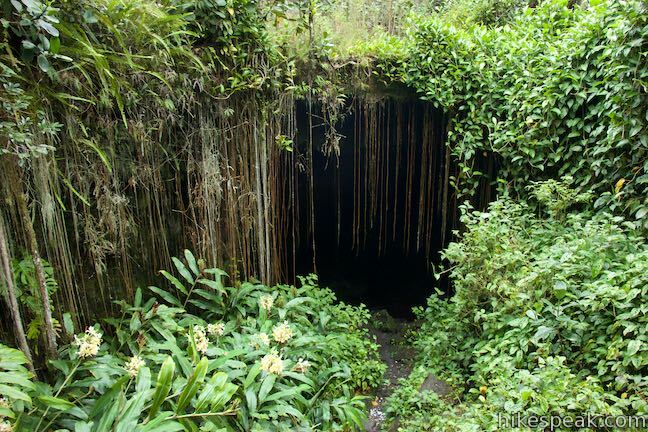 Kaumana Cave System traverses onto private property when you are not permitted to enter without permission. 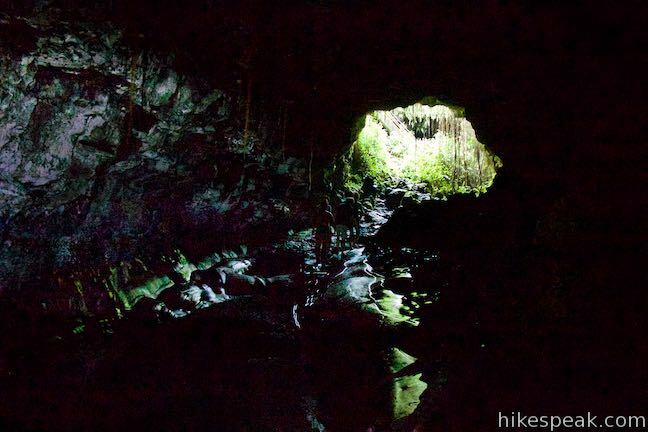 Based on the nuances of the Kaumana Caves and the risks of exploring deep into cave systems, it is probably best to just turn back after venturing a satisfying distance into each side of the lava tube. 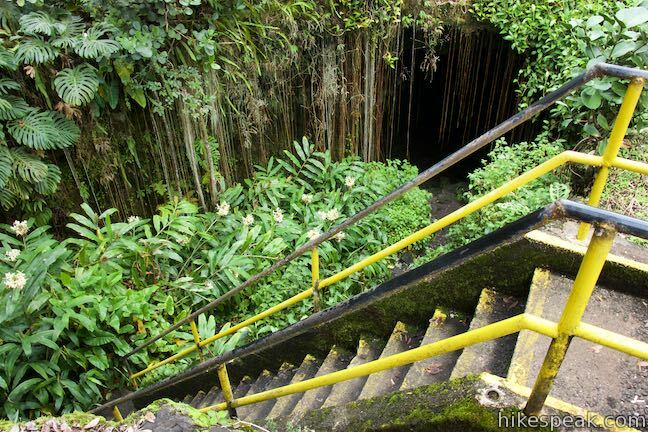 The staircase leads down into a collapsed area that splits the lava tube. 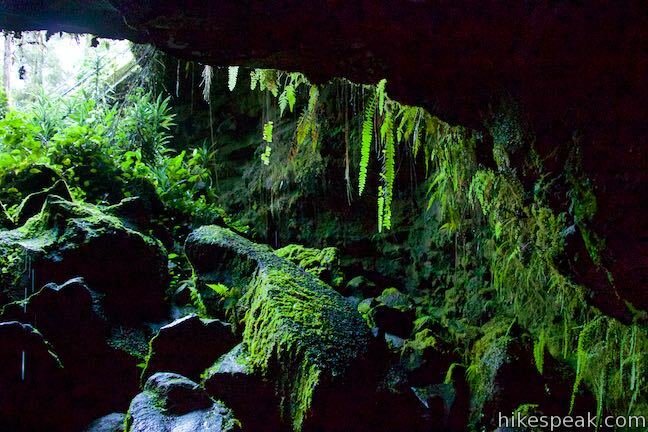 This skylight cradles a miniature rainforest where ferns and philodendron drape down the sides of the cave. 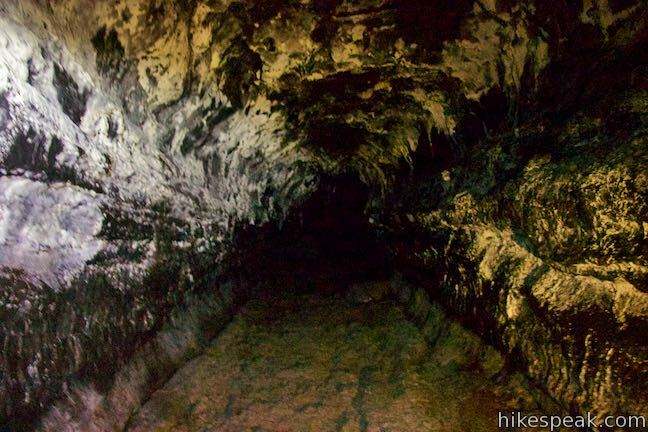 To the left and right of the bottom of the stairs are two openings into the lava tube. Turning right at the bottom of the staircase leads to the larger of the two openings. Walk down stone steps to a tall entry into the tube. 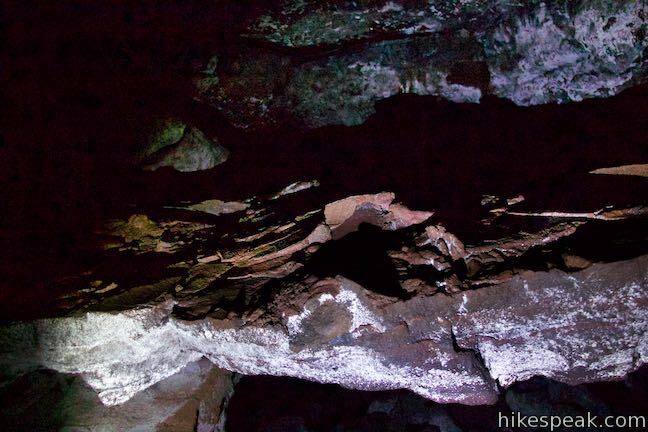 Sunlight illuminates the front of a sizable room in the lava tube. 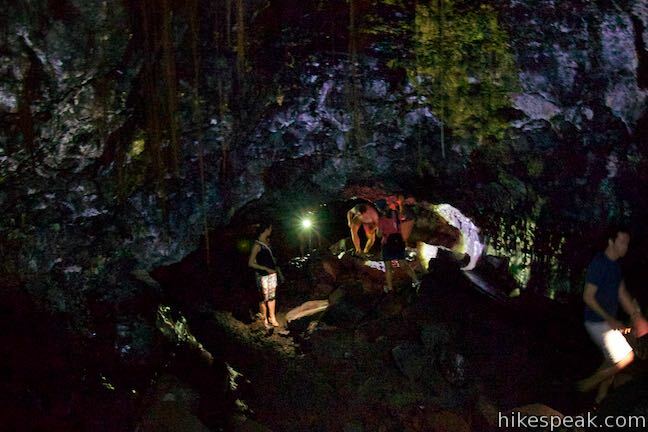 While much is visible at first, you will quickly need to rely on flashlights to see inside the cave. 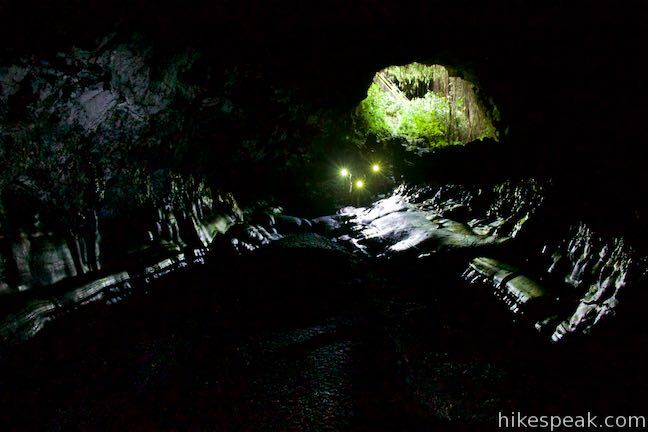 Step onto the floor of the lava tube, which has the ropy and smooth characteristics of pahoehole lava. 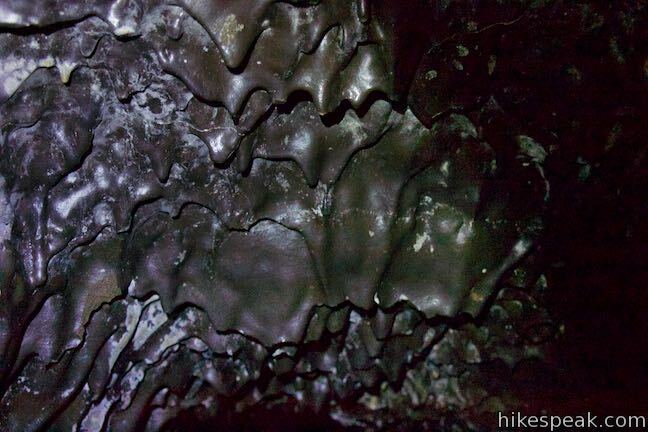 Pahoehoe is the smoother type of lava that looks like hardened batter (instead of jagged rocks of an ‘a‘a flow). 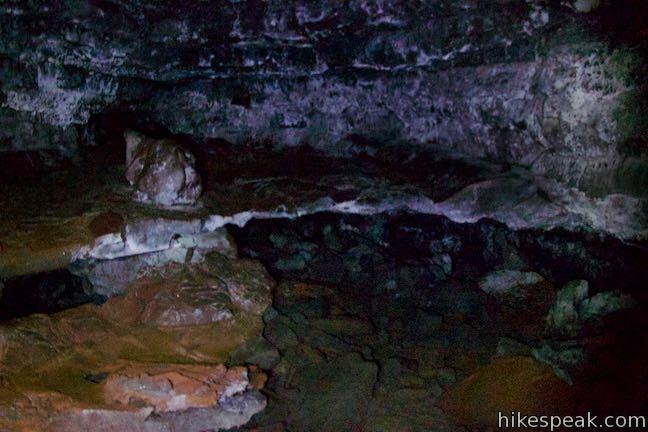 Do watch your step though, as the floor contains rough breakdown areas where lava rock has collapsed. 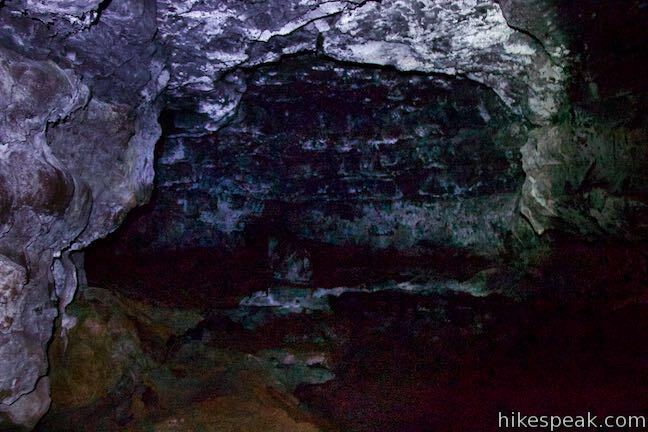 Move toward the back of the large room in the lava tube. 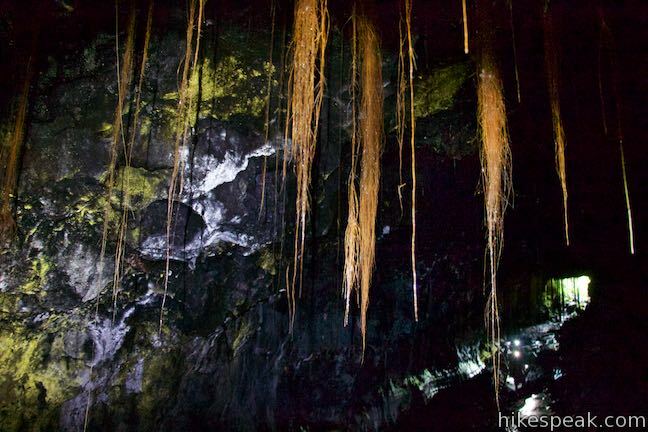 Climb up a breakdown and check out the roots hanging from the ceiling of the cave. 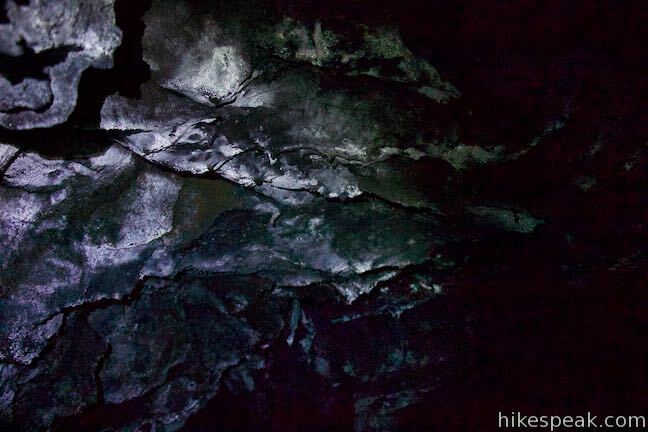 Examine the different colors of growth on the dark walls of the cave. 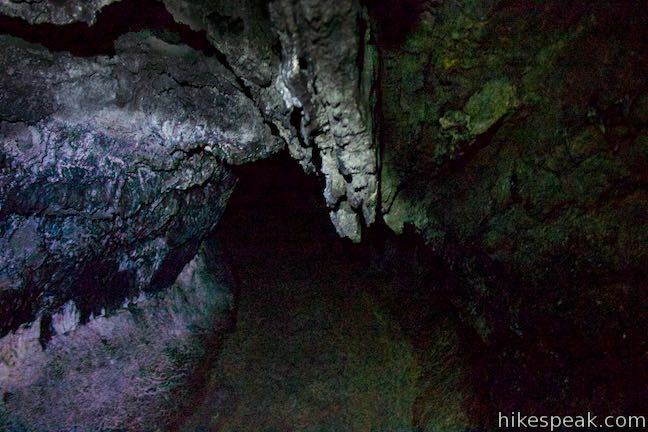 After about 100 yards, the room shrinks to a narrow passage below a cave breakdown. 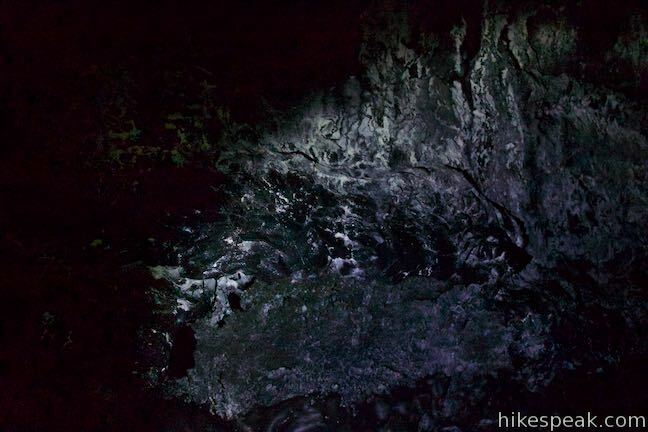 Beyond this point, the cave opens up again before another breakdown that makes passage difficult. 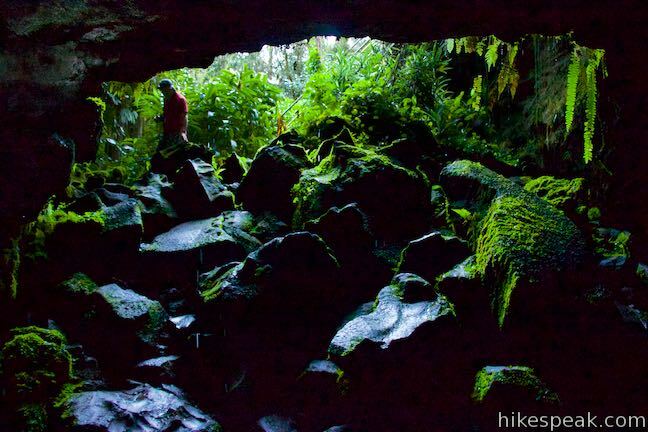 Explore what you wish, or simply enjoy the first large long room on the north side of the Kaumana Caves Lava Tube. Make your way back up and out into the open air by the staircase. Turning left at the bottom of the stairs leads to the smaller of the two entrances. 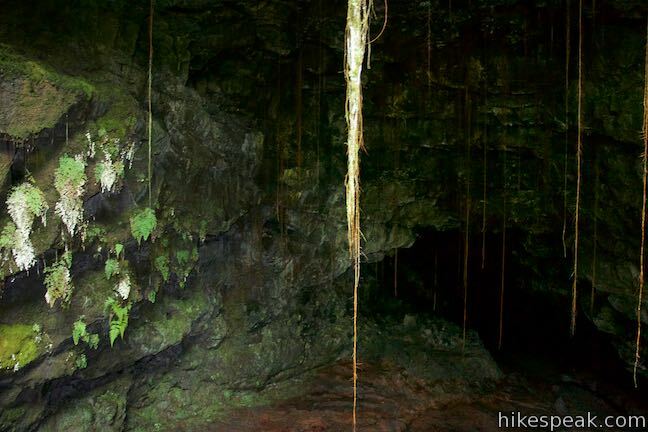 This cave opening is about a quarter the size of the other one and more difficult to access. 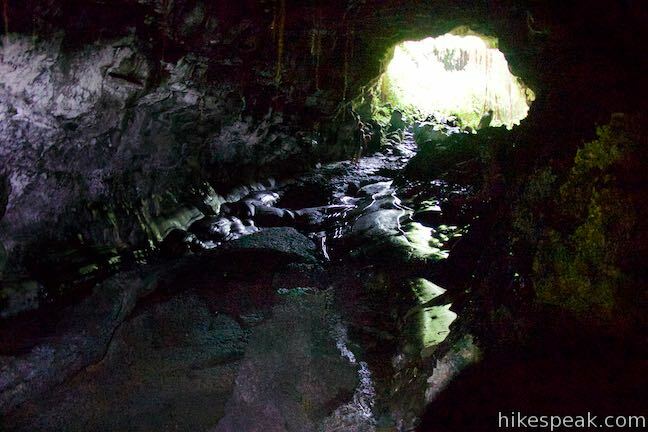 Make your way down a makeshift staircase over chunky boulders from the cave breakdown that exposed the lava tube. 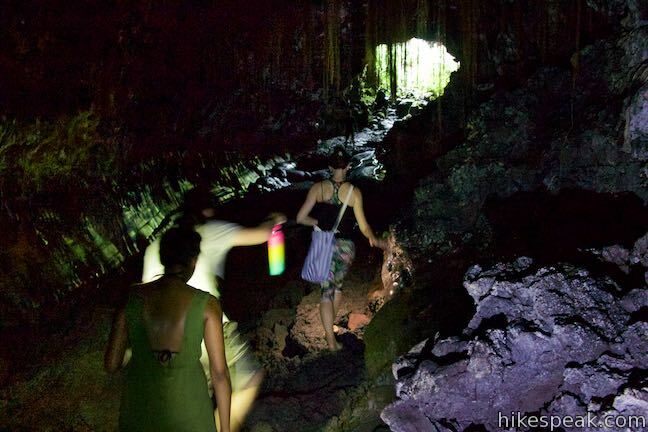 Once you get inside the cave and are standing firmly on the cave floor, notice a new obstacle ahead. 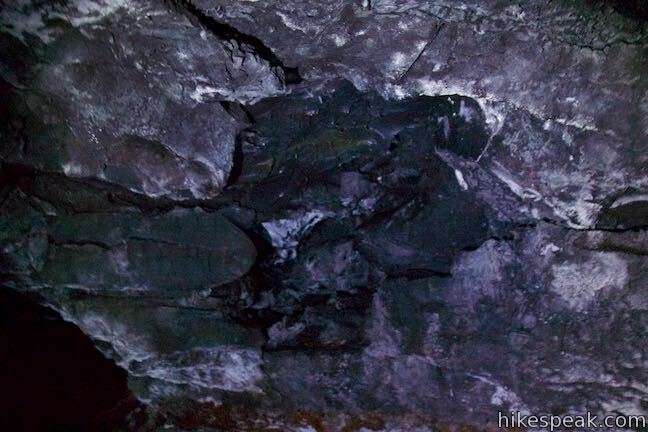 A shelf of lava rock sits right across the middle of the cave, dividing it off into upper and lower areas. At first, it might look like there’s no where to go. Duck under the shelf and scooch your way to the other side. 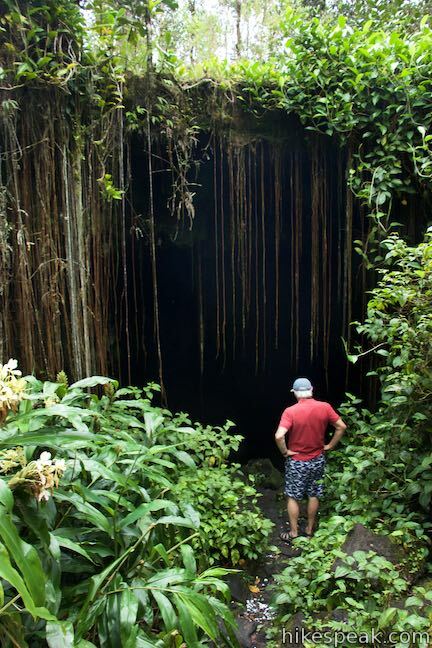 Beyond the barrier, you’ll be able to stand easily again inside a long, relatively narrow lava tube. After the early challenges, the walking becomes unobstructed. 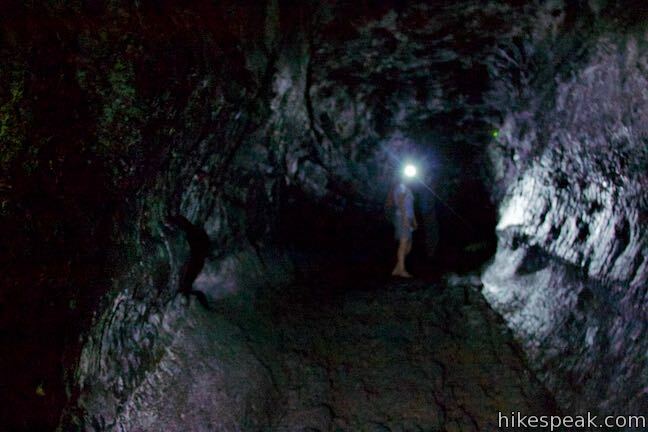 It is possible to travel for quite a long distance up the lava tube (or at least until the invisible boundary where the cave leaves county land for private property). 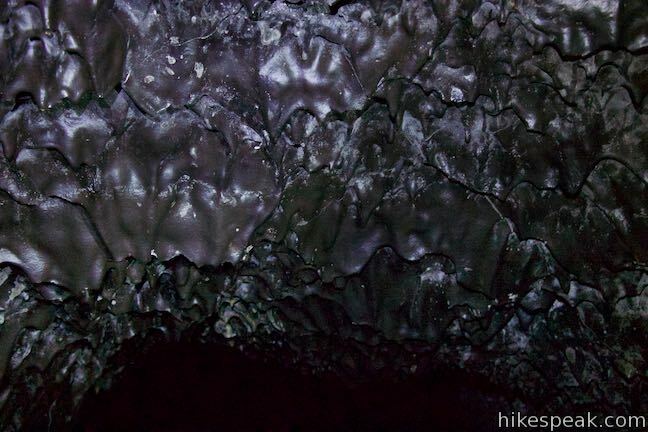 As you travel into the cave, examine all the different shapes in the lava where it has cooled on the ceiling, walls, and floor. Molten lava does some fascinating things when it cools! 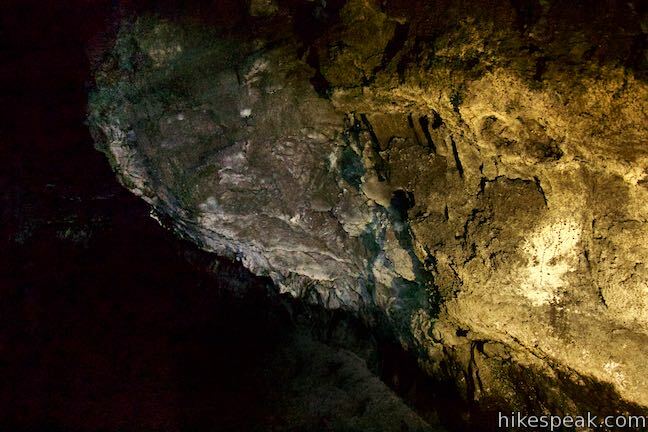 Once you have gone as far back into the cave as you’d like, or spent as much time in the dark as you care to, make your way out of the cave and take the staircase back to the surface near the parking area. 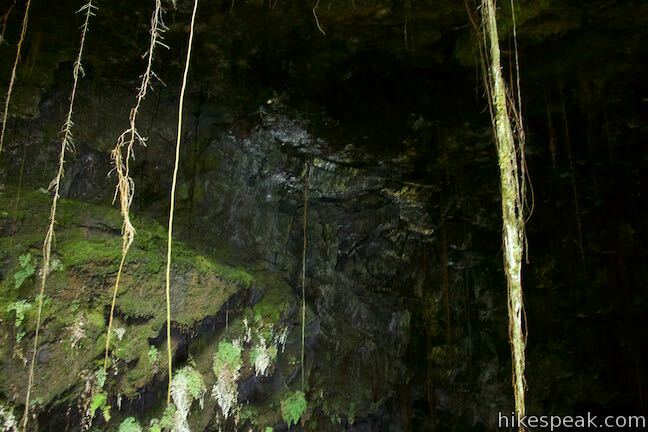 How are lava tubes created? 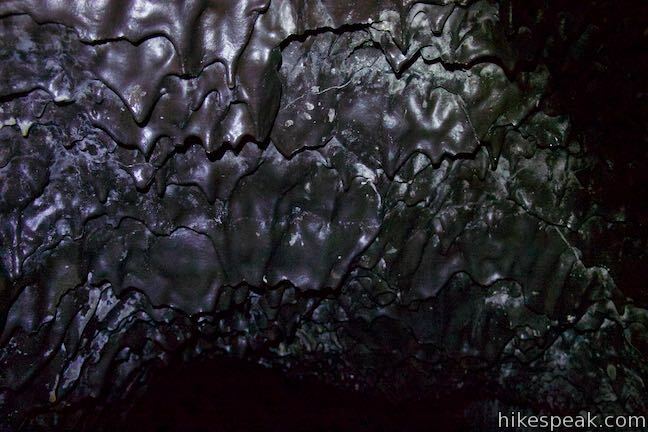 Lava tubes channel eruptions of fluid basaltic lava (pahoehoe). When Mauna Loa erupted in 1881, the surface of the lava flow cooled first, while the lava below the crust remained molten. 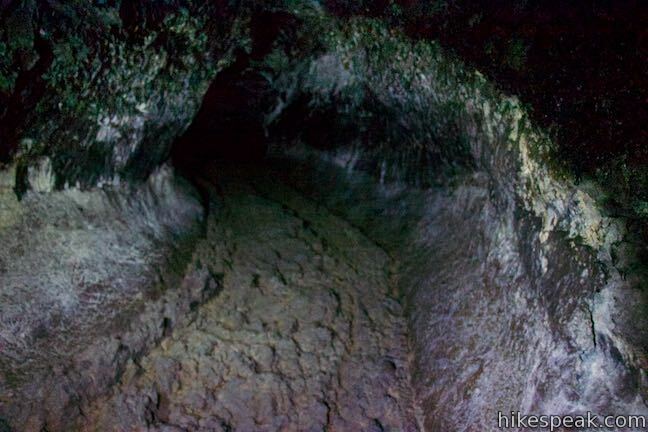 Like plumbing for the eruption, this tube formed below the surface and channeled lava downhill. 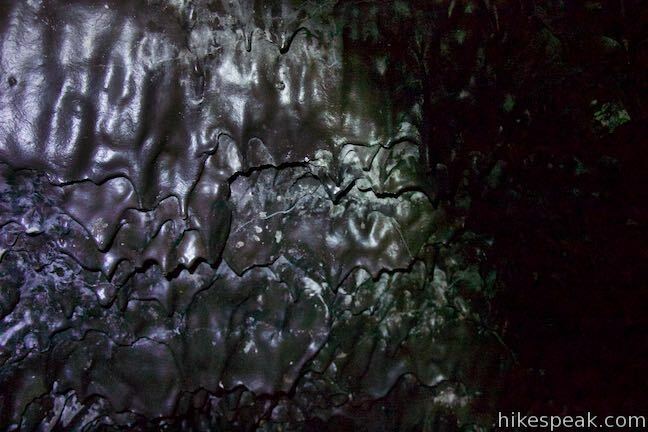 The hardened walls of the tube insulate the lava so that it did not cool until it spilled out of the end of the tube. 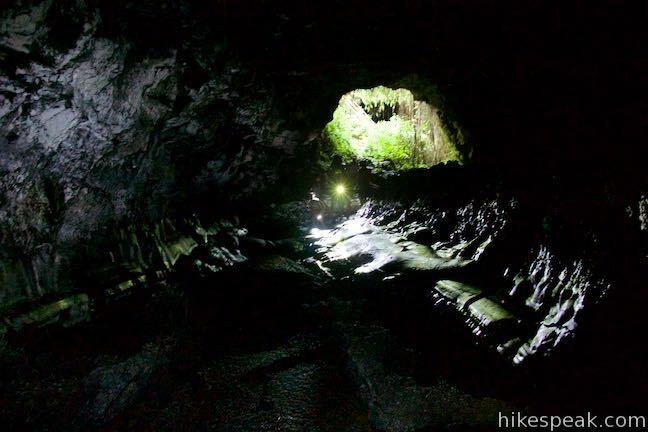 When the eruption stopped, and new lava was no longer entering the tube, the molten lava already in the tube continued its downhill flow, leaving behind an empty cavity. 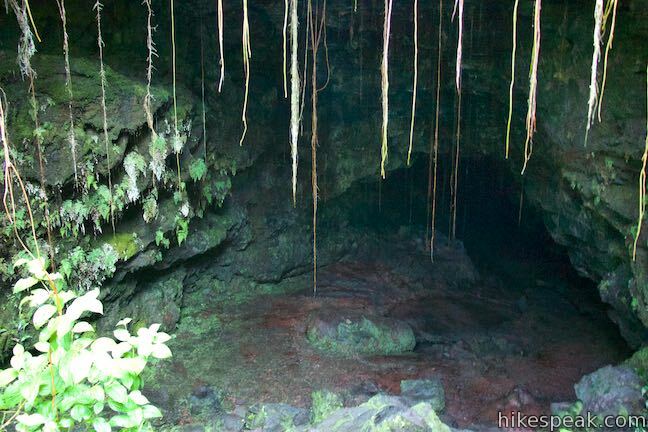 As the lava tube hollowed out, the 1881 lava flow halted about a mile from downtown Hilo (about 37 miles from the summit of Mauna Loa). Princess Ruth Keʻelikōlani of the Kamehameha dynasty is credited with saving Hilo from destruction. 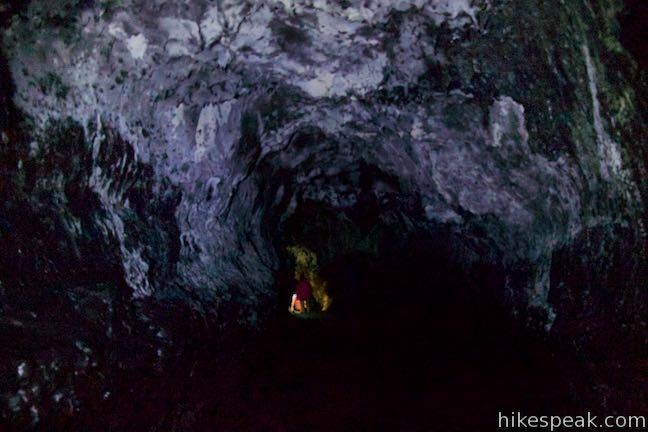 She camped in front of the lava flow and prayed to the great Hawaiian deity Pele, the creator of the Hawaiian Islands and the goddess of fire and volcanoes. 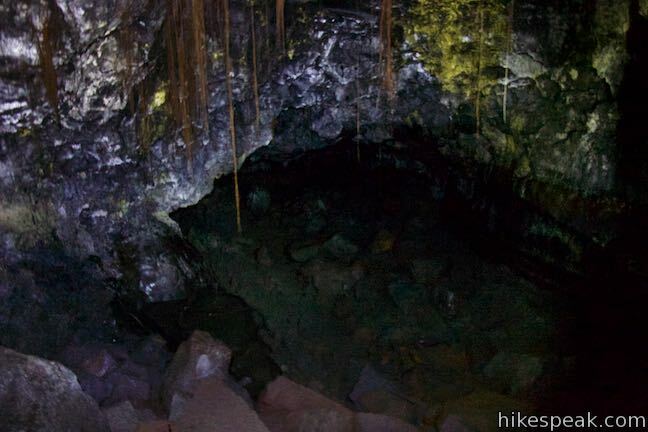 In subsequent years, an area above part of the lava tube collapsed and the caves were revealed. 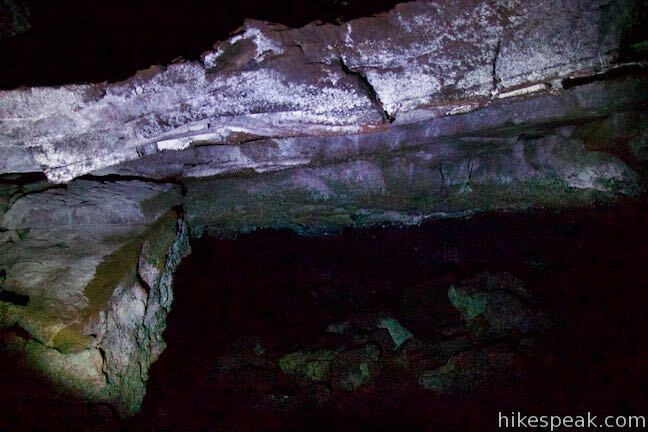 Even when the roof of a lava tube doesn’t completely collapse to create a skylight, sections of the roof can fall, called breakdowns, which leave jagged rocks on the floor of the cave to traverse. Sturdy footwear is recommended. 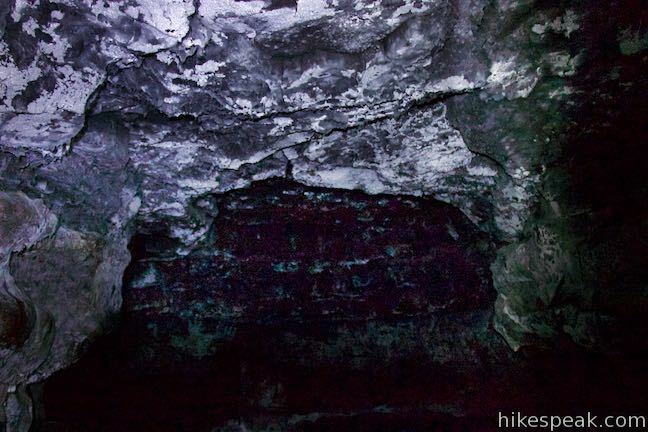 Lava tubes are very dark. Bring multiple bright lights (flashlights) per person if possible. 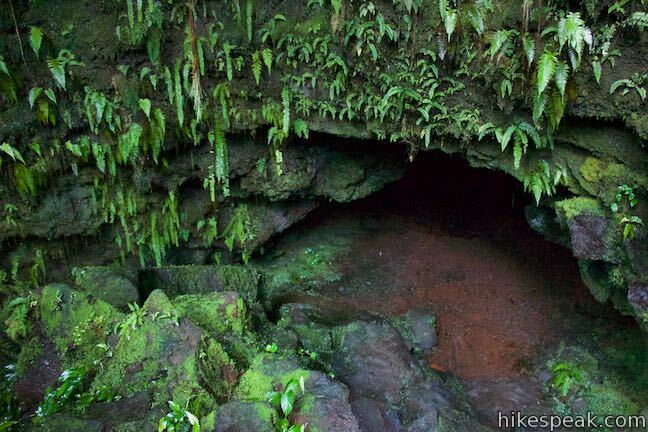 Unlike lava caves that you might encounter in the Pacific Northwest, the Kaumana Caves are warm and humid like the surface above. Pack one extra layer of clothing for safety. 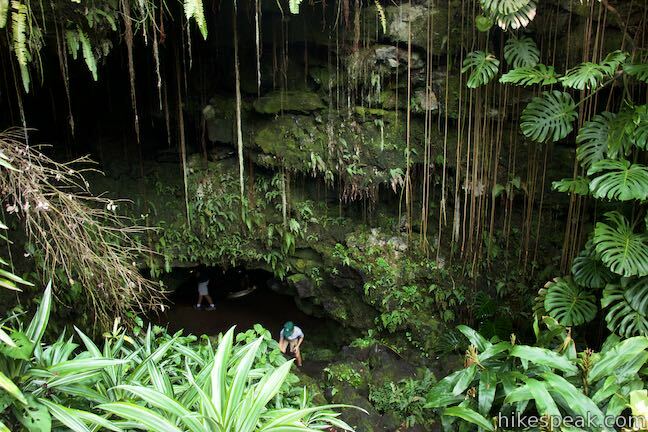 Kaumana Caves is managed by the Department of Parks and Recreation for the County of Hawaii. 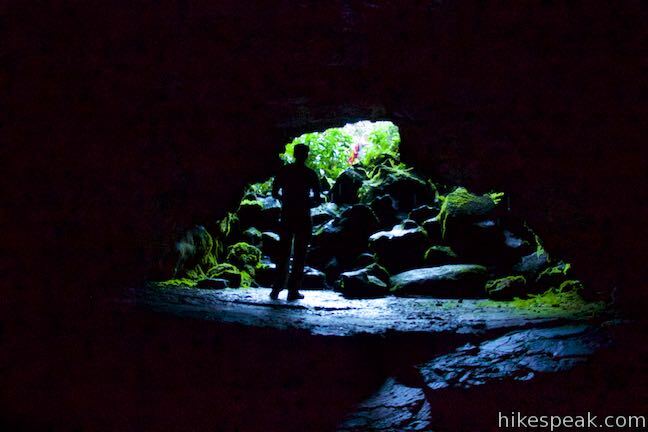 No fee is required to park at the trailhead and enter the cave, so get out and enjoy! 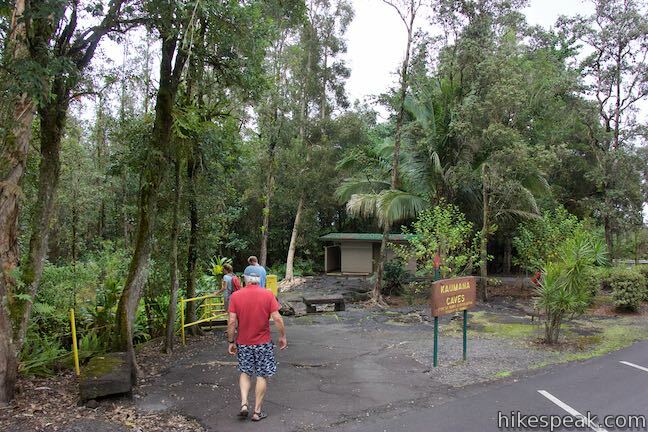 To get to the trailhead: Take Hawaii 19 (Hawaii Belt Road) to the center of Hilo and head inland on Waiamuenue Avenue. Drive 1 mile and bear left through a split onto Kaumana Drive (don’t turn right toward Rainbow Falls). Take Kaumana Drive for 3 miles. On the outside of a major bend to the right, turn left into the parking area for the caves. A sign by the entrance of Kaumana Caves is visible on the right just before the parking area. Park and walk across the road, being cautious to avoid the traffic. 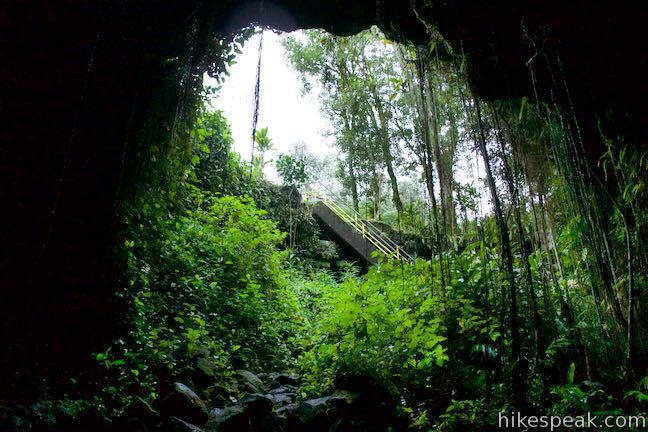 Or view a regional map of surrounding Hawaii trails. 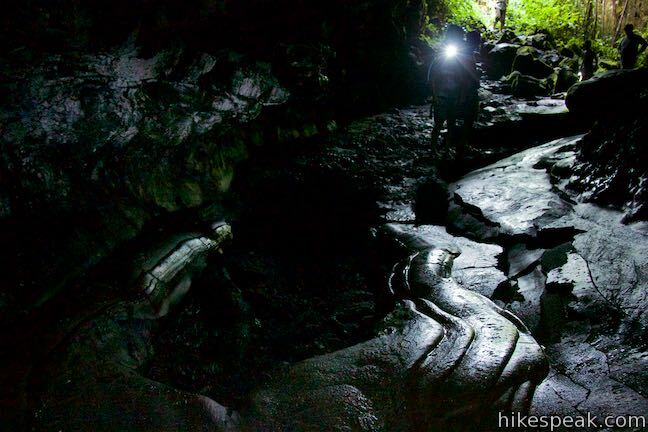 This 0.2 to 1.2-mile hike visits rare rock carvings in Puakō Petroglyph Archeological District on the west coast of the Big Island of Hawai’i.